The Coast of Lake Superior from Sault Ste. Marie to Thunder Bay is an amazing place. Many of those who have visited, return time and time again. What makes this coast even more amazing is that for as rugged and remote it is, it can be accessed by almost everyone! We will start this off with a disclaimer and warning. When shooting sunsets all precautions should be taken to avoid looking into the sun. Failing to do so can cause eye damage or blindness. There are various techniques to do this and it is worth the research to protect your eyesight. For these shots I used a Nikon D200 with a 18 – 70 lens, a 70 – 300 lens and a Nikon J 1 with a 10-30 lens. I will not hide the fact that the type of camera makes a huge difference to capture the classic sun set shot, but you still can get very good shots with some point and shoots. 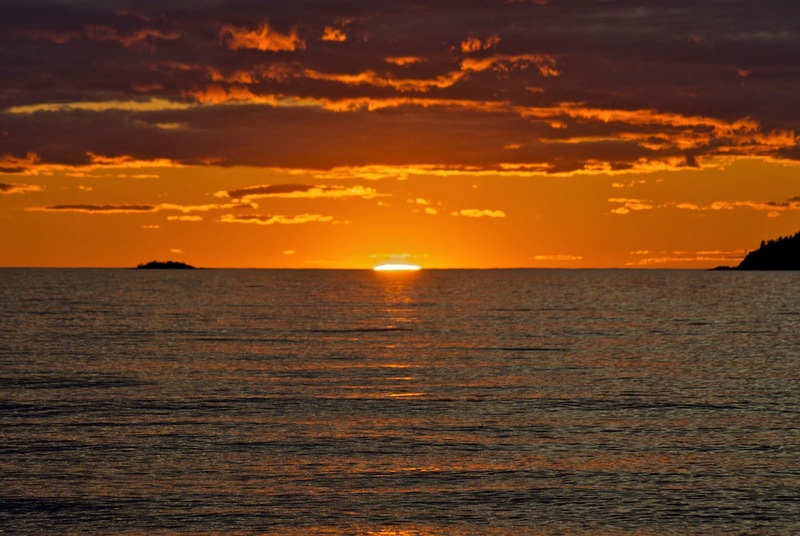 The next thing is location, and knowing where the sun will be going down and Lake Superior’s east and north coasts give some of the best sunsets of the world. Weather and atmospheric conditions also play a major roll, all of which will effect what you try and capture for your memories. There are a lot of really good people who can teach you photography, I am not one of them, but I can introduce you to an area that has inspired more than a few artists. We will start with Neys Provincial Park go to Pukawaska National Park, and move on to Superior Provincial Park. We arrived at Neys mid afternoon and the conditions where not looking promising. We went on a Park organized tour of the P.O.W. artifacts around the visitor centre and at the end they point out the old logging boats on “Prisoner Point” As neat as the old boats are and who may have ridden in them the lighting at the time did no justice to the spirits around them. Gichigami was calm and smiled upon us as the evening progressed the conditions changed to give us this. The soft orange light gave the boats a softness and glow, that even in the shape they are in now, you are transported to a different place and time. If you look at the wooden post that sticks up it will take you right to the river with these men. The soft light also softens up the rocks. Sometimes you get lucky and catch some natural phenomenon. I did see these when I took the pic because I was not looking through the viewer. Sunspots! Way cool capture! With the Northern Ontario landscape as the backdrop! Here is a link to sun spots Aug 8, 2014. On to Pukaskwa National Park. As anywhere else on Lake Superior with the conditions and cold water, where you set up to watch the Lake, and you have no choice but to respect the lake, if you do you will be rewarded, not just by the beauty, but the power that she holds. The Nikon J1 shows a much wider panorama without having to stitch a series of photos together, even tougher when you are shooting from a canoe. I feel the J1 captures the image better in brighter light. This is Horseshoe bay as the sun is starting to go down from a canoe. I like how the clouds complete the scene. For those that have visited this park know how the terrain limits you to photographic locations, so having calm conditions so you can paddle to multiple places is a real bonus. We ended up on the south arm of Pulpwood Harbour. In most areas you don’t have the vast low profile to the west that Superior offers. So while it may be cloudy/hazy overhead you may still have great photographic opportunities if you have patience. The southern Headland trail can give you great clear, vistas, and is a very close to the campgrounds to scout out what is happening in the western skies. This is where the bigger lens will come in handy to focus on specific areas. Something else to remember is on a clear day you have plenty of time but when the clouds are moving you may have just mere seconds for your shot. And then for fun look for something else and find gold! Look around! Even though you may be centred watching one area you may miss other great shots. At the same time those golden ribbons are being painted on the lake they may also be filling other areas with beautiful conditions. The combination of the reflecting light from the clouds and the sunbeam illuminate the bay between the Headland Coastal trail and the opening of Pulpwood Harbour. That brings us to Lake Superior Provincial Park, this is Ontario’s west coast. Anywhere along this shore will, after you have been given a glimpse of sunsets that will bring you back year after year. We will get back to those later, but first for the “Stuff” you don’t see from the shoreline. When I paddle the Agawa Canyon in the fall I am hoping for one of those sunsets where the squeaks underneath a cloudbank and the reflecting light illuminates the canyon. I won’t see the sunset but it is this special light that lets me get great shots far away from Superior’s shoreline. We went to Old Woman’s bay hoping for the cliffs to be illuminated, but atmospheric conditions of a fairly thick haze made the majestic cliffs flat and fuzzy, still beautiful, but something the camera could not catch. I hate to give away secrets but to sit there on a warm mid summer’s night, few bugs and have the entire bay to ourselves was amazing in itself and it was still a pretty sunset. 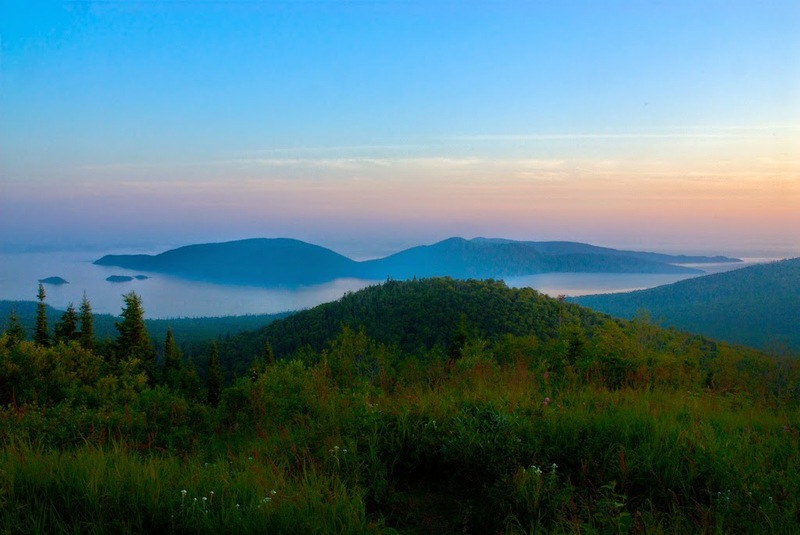 The Agawa Bay Campground is famous for its sunsets and it is accessible to everyone! And that makes it even more special. It is pretty amazing to watch the campers migrate to the beach as the sundown approaches. I like to get there early and stay for the whole show. The whole scene of sky, clouds and lake is so fluid, constantly changing, each scene being painted differently. Depending on the season and the tilting of the earth no 2 sunsets will be alike and only you will have that view and it is eye candy that will bring you back for more. These shots are from 2 different nights. So there you have it, right in our own backyard, some of the most exotic sunsets in the world. Link to album, more images will become available as I get around to changing them from raw to jpegs.